We Participate campaign at Pank SHS and Andam SHS. 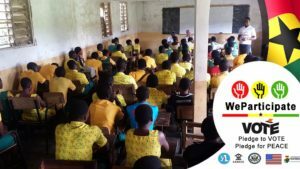 Last Friday, 23rd September the second face-to-face was held at Pank SHS and Andam SHS. The staff and students were eager to hear from the Campaign Ambassadors at both schools. At Pank the introduction was done by Bright Fiatsi, to explain the purpose of the visit and introduce the project to the school. 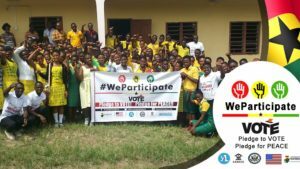 This was followed by a discussion led by Emmanuel Yamoah on the purpose of voting. He highlighted that it was the responsibility of every eligible voter to vote as that shows your love for Ghana and desire to see Ghana develop. He also enlightened them on some electoral offenses such as impersonation, bribery, treating or undue influence related to vote buying sections 32, 33, 34 or 35 of the law (PNDC 284). Emmanuel introduced the students to Douglas, who talked on having a peaceful election. Douglas made mention of some key words such as tolerance, resistance, and letting go of offences done to us, as this will help in ensuring progressive peace building. He encouraged the students to be generational thinkers- that is to say that, they should have a picture of the future and not only consider the present but also look ahead. He made mention of these as a way in ensuring peace in the upcoming election. Bright Fiasti concluded by saying, “God will do His part but we also have a part to play”. At Andam, Mamley Adams used an interactive role playing scenario, where by students had to vote for leaders of the class and the leaders had to make immediate decisions about the class. Some of the students did not vote, others voted just because the candidates were their friends, and others wanted to vote twice. She used the scenario to explain to the students how it’s important for every eligible voter to vote as decisions taken by the elected leader affect all. She also illustrated the importance of voting for candidates that are capable and obeying electoral rules. Raymond Taku afterwards spoke to the students about the importance of peace and ensuring that every Ghanaian enjoys the peace in the country and tolerate each other. 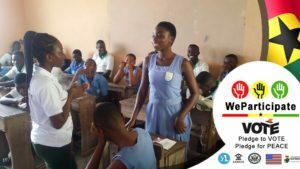 Four students volunteered to be ambassadors at Pank SHS and two at Andam SHS. All the student ambassadors were also presented with a lacoste and introduced to their roles.